Future versions of SysFACE will incorporate extensive microarray data generated from newly generated or published datasets. In combination with other genome-wide studies e.g. 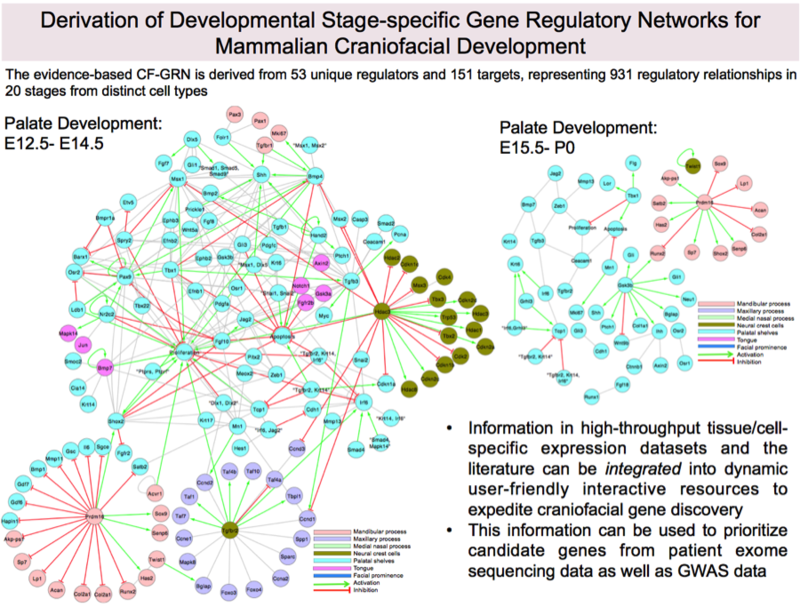 NIH-supported FaceBase initiative, network of validated gene regulatory relationships, and effective use of bioinformatics algorithms, newer versions of SysFACE will be more comprehensive and lead to the understanding of orofacial development and pathogenesis, as well as for the highly efficient identification of disease associated genes in genomic intervals in human patients. Further, we are currently assembling a curated evidence-based gene regulatory network for craniofacial morphogenesis (see figure below), which will be integrated into future versions of SysFACE.